There's Power in God's Promises! Simple and profound. The Christian walk was meant to be simple and profound. It’s a walk through good times and hard times. Matt and Beth Redman tell us how it can be a worship walk even in the times of suffering. Worship is a choice, and the choice is ours. Although the slaves cried out to God in their Gospel songs of worship, Redman found that there were only a few modern worship songs stemming from suffering. “Blessed Be Your Name,” came shortly after that revelation. Finding God in the Hard Times, formerly named Blessed Be Your Name, grew from the song. From David’s and Joseph’s troubles to the Redmans’ trials, we learn that on the road of suffering, we have a choice to turn our thoughts and voices from our problems back to praise. At the end of each of the five chapters, there are questions for reflection.This is an excellent tool to use in a small group Bible study. In fact, the Redmans have also provided a small group discussion guide at the end of the book. This second edition includes two letters from women who have written to the Redmans to share how greatly the song “Blessed Be Your Name” helped them on their road of suffering. The soil of the Redmans’ suffering has produced many seasons of fruit through this one worship song and this one book. I will purchase several of these books to give to others on the road of suffering. I received this book from Bethany House Publishers for my honest review. Father, thank You for Your great grace in showing us how others have suffered and chosen to trust in You and praise You through their suffering. Thank You for Matt and Beth Redman. Bless them with much joy and fruitfulness. Bless Your children with the knowledge of the simple truth that You are in control and that You have plans for them, and Your plans are always good. Blessed be Your Name! Please share how you are choosing to worship God. Dutch Sheets addresses a much-needed subject for today’s busy Christian in The Pleasure of His Company. Sheets walks the reader through the Bible to examine followers like David, Joshua, Paul, Jesus, and even Samson. Throughout the book of short meditations, he peppers his writing with practical, everyday applications, many times stemming from his relationships and marriage. Sheets ends each devotion with a prayer focused upon the Scriptures covering the chapter’s topic. He lists the Scriptures at the end of the prayer, so that the reader can look them up and meditate upon them further. Sheets reminds the reader that if we set ourselves apart unto God, holiness will follow. This “setting apart” is not convenient or inexpensive, but the pleasure of hearing God’s heart serves as a catalyst that creates a hunger for more intimacy. 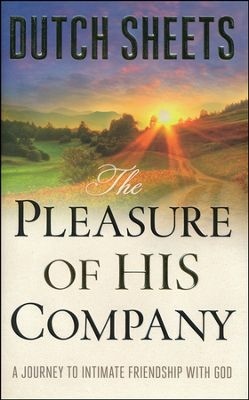 The Pleasure of His Company came to me at just the right time to make a meaningful impact on my life. I was able to look at my relationships and apply the principles he addressed. I plan to purchase multiple copies of this book to give away. I received a complimentary copy of this book from the publisher, Bethany House, a division of Baker Publishing Group, in exchange for my honest review. Father, thank You for always being there for us. Bless, we pray, Dutch Sheets. Thank You for the pleasure of Your company. Teach us to wait upon You and rest in Your presence.